As you can see, the graphics created for this database (all done by @wtforkgaming) are incredible; the club’s preferred formation could probably be considered a part of the ‘DNA’, and it’s something I’ll have to think about – I could conceivably try to get a 3-3-1-3 working, but it’s not a formation I’ve ever used in the past. We’re not the richest club in Aswijan, not by a long shot, and our facilities and youth development aren’t top of the line either. Overall, looking at the information above, I’d pitch us as a mid-table team with scope to grow, and looking at the season preview, the game certainly seems to agree, with our current predicted finish 14th. The club have won two Liga Principale (Aswijan has 3 leagues – Regale, Principale and Dukh) titles, but have never won a top division or any cup competitions. 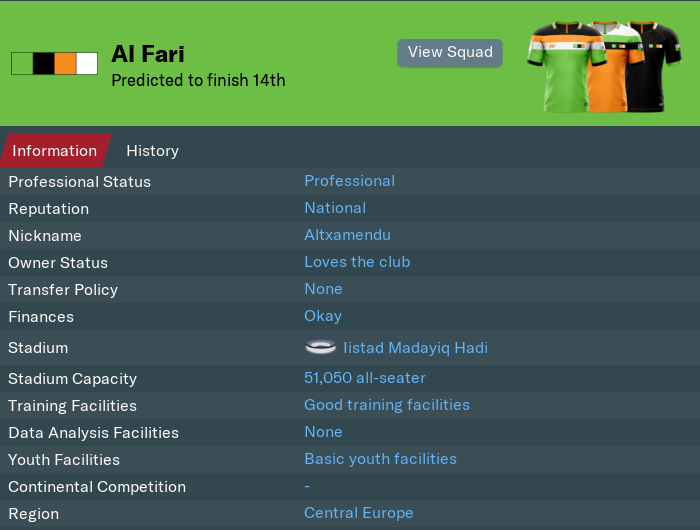 Obviously, my goal is to change that throughout the save, and eventually win the Champions League. Doing so will involve careful management of finances and growing the club where possible. As you can see, we’re already over-spending on wages, and as I do on most saves, I’ve had to sit and do some working out, balancing wages and gate receipts, to see what we can afford to spend on wages to ensure we don’t outspend our means. To do this, I take our season ticket revenue, and predict what I think our average home attendance would be, and figure out the gate receipts from there. We have a 50,000 seater stadium, and 35,000 season ticket holders, so I’ve pitched our average attendance at around 45,000, which means 10,000 buying a ticket on the gate every week, as it were. The advantage of doing my wage budget this way is that we’re then highly unlikely to over-spend what we’re making each season, especially as it doesn’t factor for sponsorship, prize money or transfers; once I’ve adjusted my budget to the correct level, we’re left with just £4.5m in the transfer budget, so we’re going to have to go with the squad largely as it is. Before I get stuck into any tactics or looking at the squad, I want to take a bit of a look around our backroom staff, and see where we can make improvements – I think our playing squad are good enough to land us mid-table, so I want to make sure that our infrastructure is right going forward, and this starts with our coaching and scouting staff. My initial coaching team were of reasonable standard, but I did replace one coach who had a determination of 9 and mediocre technical attributes with a slight upgrade in the form of David Platt, who has a good mixture of strong mental and technical attributes, and a determination of 16, which should – if I understand the game properly – rub off on the players during training. I also had to replace our goalkeeping and fitness coaches, who had 9 and 10 attributes for their coaching areas, which just isn’t acceptable to me, so we’ve replaced them with upgrades for now, and I’ll continue to scout once every month or two for coaches who can improve our coaching team – it’s something that I often overlook, but it’s also something that I want to focus more on going forward, given the insane amount of talent within Aswijan. Speaking of talent, my next stop was to improve my coaching team; across the board the judging of ability and potential ability was poor, so I’ve made a start on re-vamping my recruitment team; I’ve picked up a couple of good scouts, but still need to fill the roles of Director of Football and Chief Scout, so I’ve put out adverts for those roles so that we can start to scour the globe for new talent.